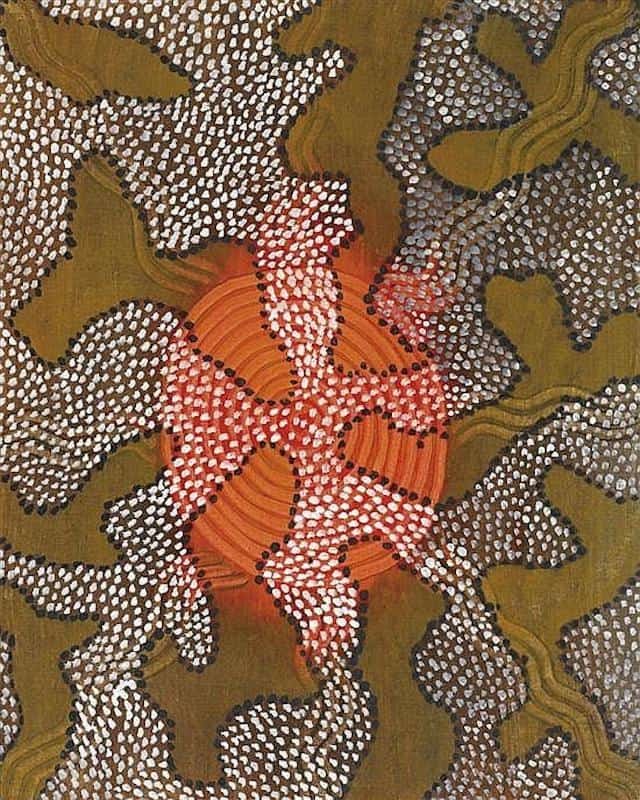 Tim Leura Tjapaltjarri was one of the founding members of the Western desert Aboriginal art movement. In the early part of his career, he painted on small pieces of Composition board with great detail and symmetry. In the latter part of his career, he was painting large canvasses in a style all of his own. 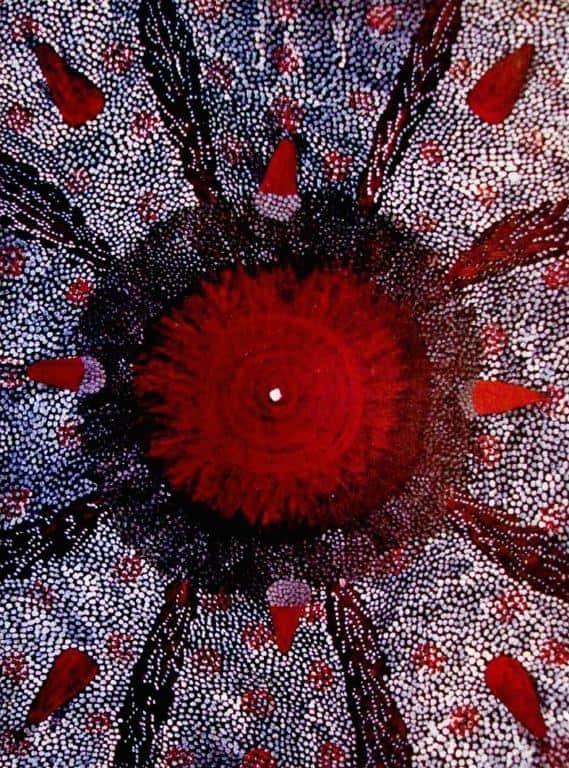 The aim of this article is to assist readers in identifying if their Aboriginal painting is by Tim Leura Tjapaltjarri. It compares examples of his work. 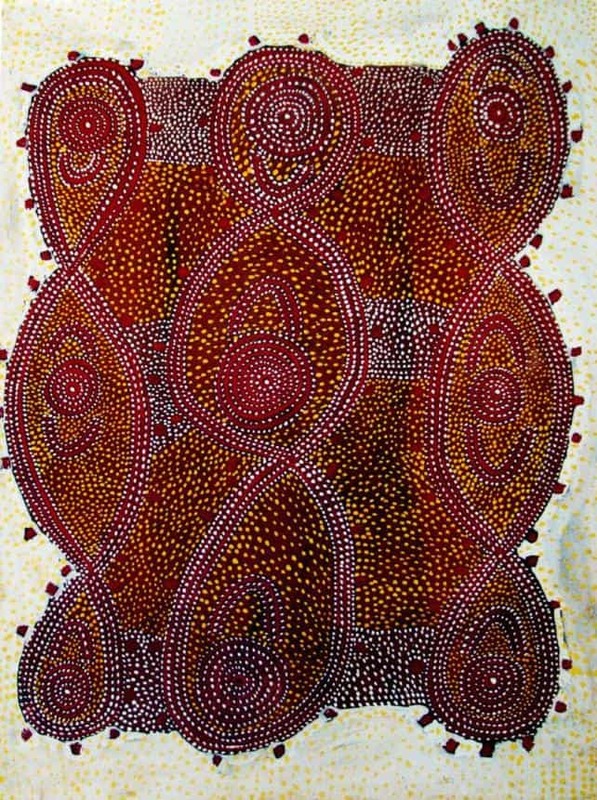 If you have a Tim Leura Tjapaltjarri Aboriginal painting to sell please contact me. If you want to know what your Tim Leura painting is worth please feel free to send me a Jpeg. I would love to see it. 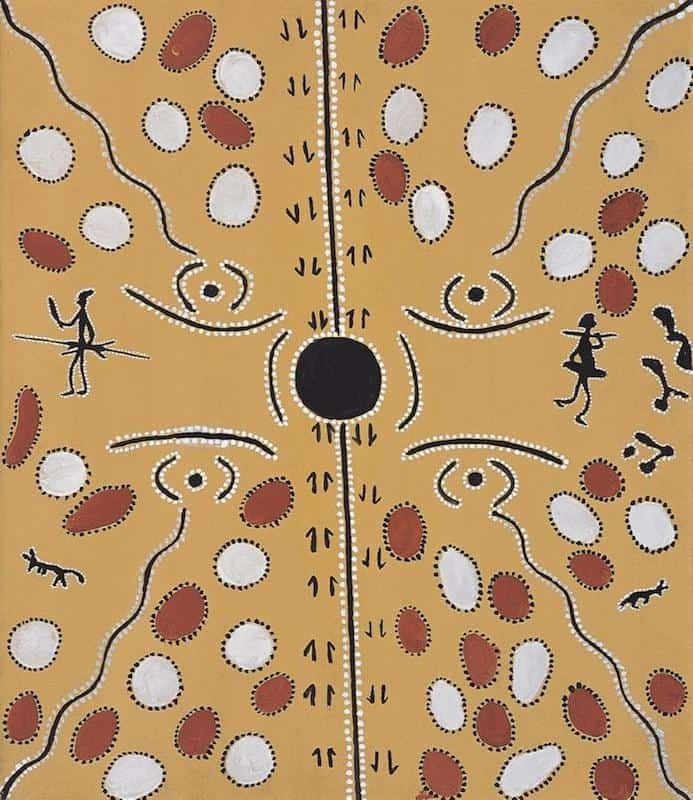 Tim Leura Tjapaltjarri was born in 1934 and grew up and worked around Napperby and nearby cattle stations. The cattle stations had taken over his traditional tribal land and he became a stockman. Working for white people gave him a command of English as well as some familiarity with European ways. Tim formed close contacts with other aboriginal stockmen at this time including Billy stockman Kaapa and Dinny Nolan. His clan still maintained tribal traditions and Leura was fully initiated and versed in ancient aboriginal lore. In the 1960’s he settled with his wife Daisy and their six children in Papunya. In 1971 Geoff Bardon became a local school teacher at Papunya primary. He tried to encourage local children to paint in their own traditional style. When he was told only older men could paint these stories he decided to start a local men’s painting group. Leura initially followed the ordered and symmetrical style that typified his Anmatyerre Arrernte tribal group. He was drawn to subdued tones, mixing colors, dotting on to wet grounds, and blending outlines. His shapes would often run into each other. 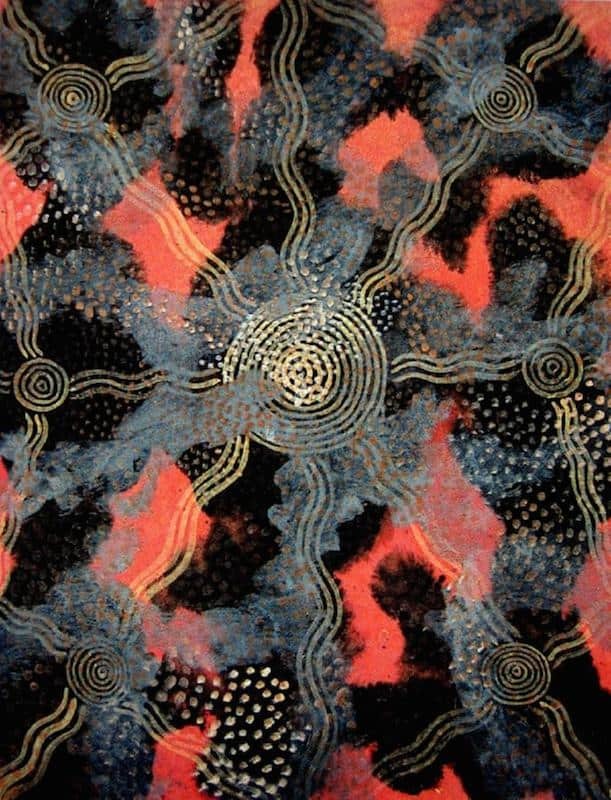 Tim Leura Tjapaltjarri quite quickly began to develop his own distinctive painting style. He did not stick strictly to traditional designs but was willing to alter his work to make it more appealing to Europeans. This desire to straddle the cultural divide helped him to become a leading figure in Aboriginal art. Tim Leura is said to have anguished over the loss and the humiliation his people had suffered. At the same time he recognized that the eternal stories of his Dreaming must be kept alive and passed on to the new generations through painting. 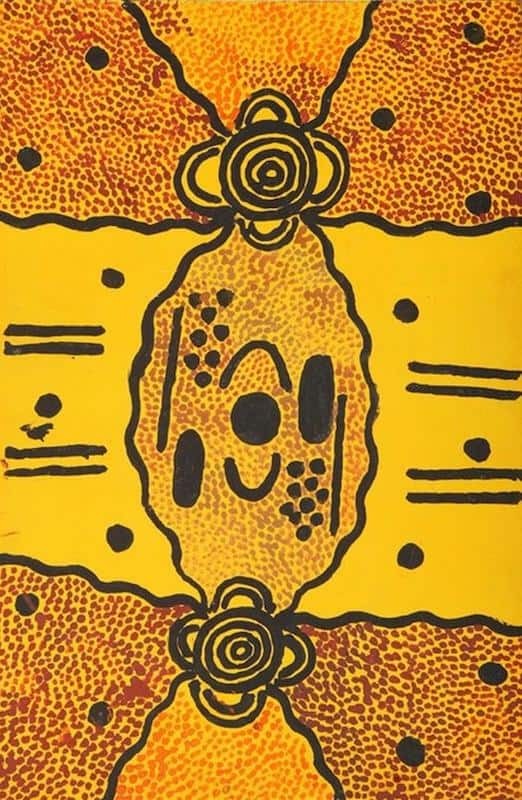 Following the establishment of the Aboriginal Arts Board by the newly elected Labour government in 1972, Leura participated in a successful delegation to Sydney to secure funds for the emerging Papunya Tula enterprise. In 1974 artworks for sale at Alice Springs and in Perth caused severe problems for Bardons painting group. 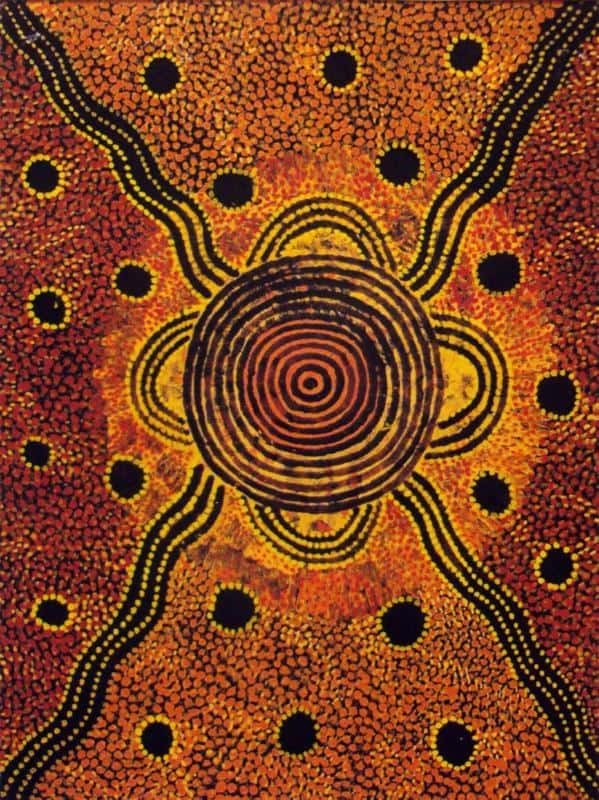 Other aboriginals were upset that to much secret and sacred knowledge was being painted. This lead to the group having to veil secret designs with dots and paint less important songlines. 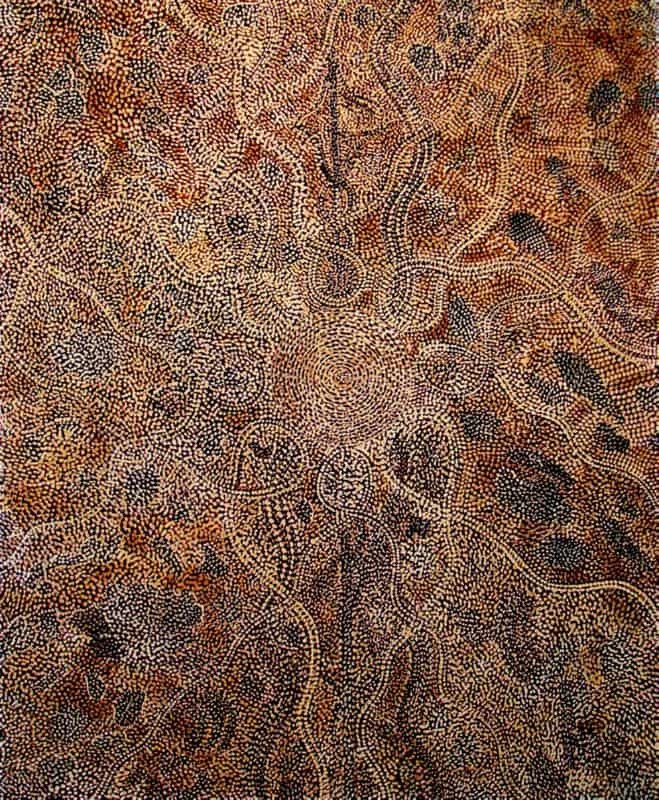 Tim Leura Tjapaltjarri moved away from traditionally strict topographical and totemic mapping towards increasing artistic experimentation. This suited Tim Leura well as he had been experimenting and adjusting designs for some time. His art was already more in keeping with the move to secularise the sacred Dreaming stories. With great subtlety, he would include stylised animal, plant or skeletal human figures. He achieved this without disturbing his partiality for balance and clarity of design. 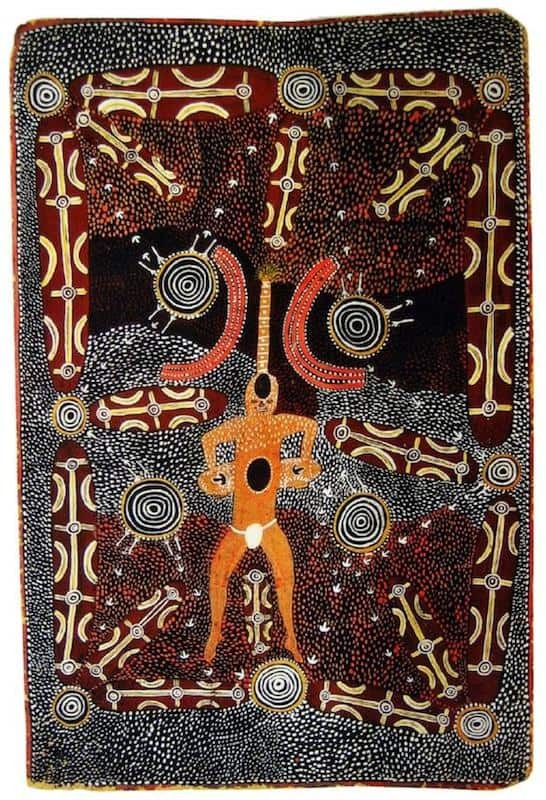 He painted on canvass in brighter colors and often he depicts traditional songlines but then heavily veils them with dots and additional design elements. 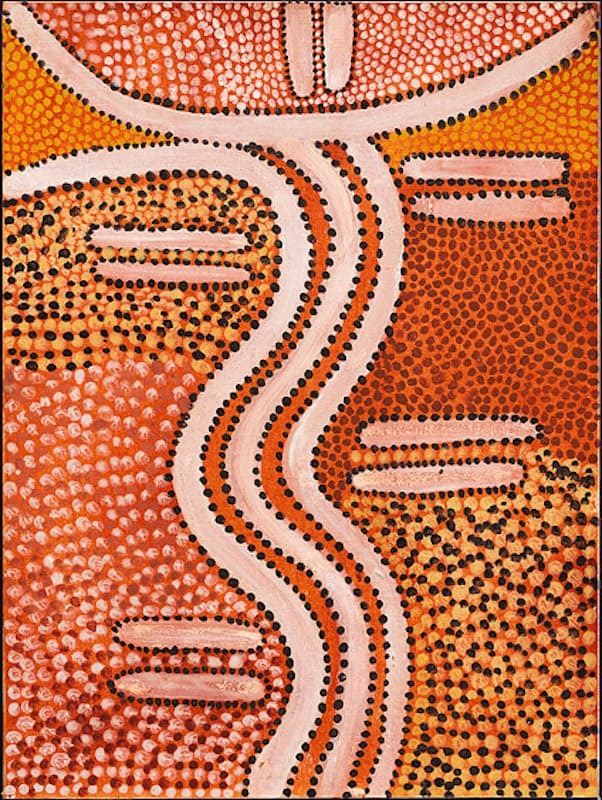 It is the dots and design elements that are now so often recognized as being aboriginal dot art. Tim Leura Tjapaltjarri was “brothers” with Clifford Possum and not only his spiritual mentor but instrumental in the development of Possum’s talent and technique. Today Clifford is by far the better known of the two. 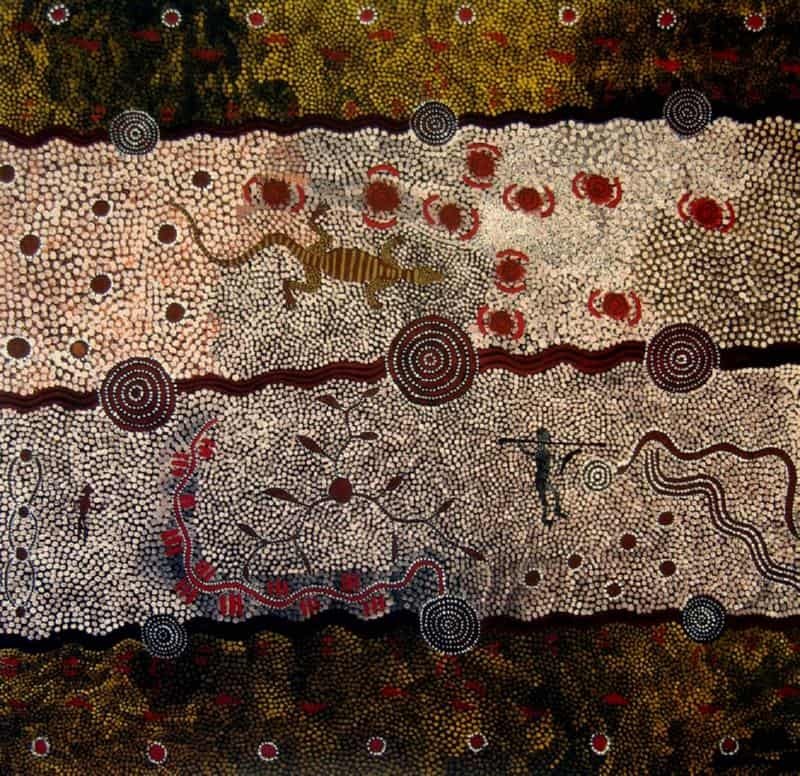 In the mid 70’s Leura and Clifford collaborated on a series of monumental paintings incorporating several Dreaming stories in a map like configuration. These collaborative canvasses are masterpieces of Central desert art. These collaborative masterpieces were on huge canvasses and although both artists were equally involved today it is Clifford Possums name that is remembered. Napperby Spirit Dreaming, was collaboratively painted in 1980. It was the principal painting in the landmark Asia Society, Dreamings exhibition. It is now in the collection of the National Gallery of Victoria. This seven-metre masterpiece departs from strict tradition to reveal a subjective gathering of their Leura and Clifford’s life history. It contains areas which depict the Dreaming totems that sustained their life while a classic journey line runs through them. The journey line passes a skeletal spirit figure who waits and watches beside three resting spears. The sombre, dappled surface reflects the deeply felt memory of Leura’s birthplace. It recreats qualities of the landscape: leaves, smoke and grass, sand and earth imprinted with tracks and footprints. Clifford Possum’s crisp traveling line and central row of circles, contrasts with Leura’s meandering mode of building atmosphere through the disolution of solid form.